up to suit your mood and schedule. Hosting a party? Check out Celebration! Looking for lunch ideas? See Get Prepared! Stuck for time? Look at On-the-Go! Find new ideas each day, all week long. 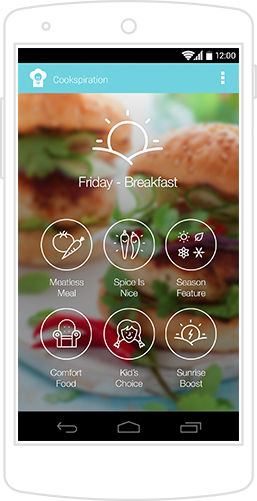 Unleash your culinary creativity with the information and dietitian-approved recipes featured in this app. Access a wide array of recipes with photos to fit any palate or appetite. Someone in your household likes it hot? Check out Spice is Nice! Need ideas that are easy on the pocketbook? Find them in Budget Friendly. Have picky kids? Review Kids Choice. Each recipe showcases the nutritional details in the Nutrition Info section.